Hercules movie announcement starring Dwayne Johnson | Radical Studios, Inc.Radical Studios, Inc.
MGM and Paramount Pictures to bring Radical Studios’ Hercules: The Thracian Wars to the big screen. 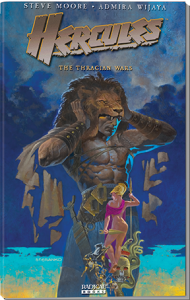 November 7, 2012, Los Angeles, CA – Radical Studios is excited to announce that its best-selling original graphic novel Hercules: The Thracian Wars will be adapted as a motion picture to be co-produced by MGM Studios and Paramount Pictures. Hercules is an original graphic novel written by Steve Moore for Radical Studios. It is an action-filled story based on the popular Ancient Greek mythology of Hercules. The film stars Dwayne Johnson and is directed by Brett Ratner. Hercules will be produced by Radical President Barry Levine, Beau Flynn and Brett Ratner. Peter Berg, Sarah Aubrey, and Radical EVP Jesse Berger will executive produce. The screenplay was adapted by Ryan Condal with script revisions by Evan Spiliotopoulos. Production is scheduled to start in early 2013. Hercules is the second Radical Studios project set to reach the big screen following the recent wrap of production on Oblivion. Oblivion is an original concept conceived by TRON: Legacy director Joseph Kosinski and developed by Radical Studios. The film stars Tom Cruise, Andrea Riseborough, Olga Kurylenko, Morgan Freeman, Nikolaj Coster-Waldau and Melissa Leo. Oblivion is being produced by Peter Chernin, Dylan Clark, Joseph Kosinski, Duncan Henderson and Barry Levine, with executive producers David Morrison, Jesse Berger and Justin Springer. Oblivion is being distributed by Universal Pictures and is set for an April 12, 2013 IMAX release and April 19, 2013 worldwide release. Please visit http://radicalstudios.com/ to learn more about Hercules: The Thracian Wars. The graphic novel is available for purchase on the site as well as digitally through iTunes and Amazon. Radical Studios will continue to release news and updates surrounding both Hercules and Oblivion. Stay informed by liking Radical’s Facebook page at www.Facebook.com/RadicalPublishing, following Radical’s YouTube channel at www.YouTube.com/RadicalPublishing, and following @radicalstudios on Twitter. About Radical Studios: Radical Studios is a multimedia studio business model centralized around a catalog of stories and characters that are used as a basis for generating revenue streams across all media channels. The company is currently focused on building strong and diversified licensing revenue for its intellectual properties in both domestic and international markets, in physical and digital publishing, feature films, television, merchandise, recorded music, digital and online media applications and mobile and social games. Radical is represented by David Schiff of The Schiff Company and Phil Rosen of Rosen Law Group. Dwayne johnson looking busy in 2013..